Quite unexpectedly, the American presidential election of 2000 has become the most remarkable and in many ways the most unsettling one that the country has yet experienced. The millennial election stretched for well over one month, and its repercussions are sure to be felt for a long time to come. It has raised fundamental questions not only about American democracy but also about the nation's more than two-hundred-year-old Constitution and about the legitimate role of American courts, state and federal and in particular the highest court in the land, the United States Supreme Court, which in effect put an end to the election in a bitterly divided 5-4 decision rendered on December 12, 2000. As the polls began closing on the evening of election day, November 7, 2000, there was no reason to anticipate any of the remarkable developments that were about to unfold. True, there had been a closely fought and vigorous campaign and much heated rhetoric. The intensity of the candidates, however, by and large did not spill over to the great majority of the voters. The country was at peace and in the midst of a long period of unprecedented prosperity. Moreover, in spite of their sharp differences, Bush and Gore seemed to aim for the center of the American political spectrum. The opinion polls had been fluctuating, but Bush had maintained a small but steady lead in all the major polls in the weeks leading up to the election. On the eve of the election, most pundits were confident that Bush would win the popular vote, although some speculated that there was a remote chance that Gore might win a majority in the Electoral College. If that were to happen, moreover, it might well rekindle the debate over abolition of the Electoral College, one of the seemingly most vulnerable institutions of America's eighteenth-century Constitution. With the completely unexpected sequence of events after election day, however, the debate about the Electoral College would turn out to be but one among many, and it would by no means rank at the top of the list. There was nothing unusual until well into the evening of November 7. In the early evening after Bush and Gore were each predictably projected the winner in respectively solidly Republican and staunchly Democratic states, the television networks predicted that Gore would win key toss-up states like Michigan, Pennsylvania, and Florida. This was a little surprising but well within the possibilities envisaged by the experts. Based on this, moreover, the Democrats were beginning to think that they would keep the White House after all. The Democrats' newly raised expectations would be short lived, however, as around 9:00 p.m. EST, in the first truly unusual moment of election day 2000, the networks retracted their projection that Gore would win Florida and placed the state in their too-close-to-call column. Although this retraction was unusual in terms of network coverage of presidential elections, it did not presage the highly unusual turn of events that would soon ensue. As a matter of fact, even the networks' later projection that Bush would win Florida followed by a second retraction as dawn was approaching did not necessarily foretell anything unusual about the election itself, though it made it quite clear that something had gone awry with the way the media were covering it. Even Gore's retraction of his concession to Bush after the networks took Florida from the latter's column—though highly unusual in the annals of television age presidential election concessions—could readily be interpreted as caused by misplaced reliance on the media rather than by any problems with the election itself. 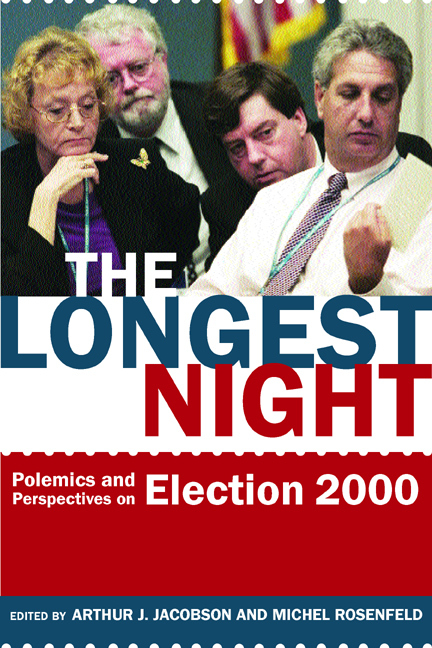 As the chronology that follows indicates, the magnitude of the problems posed by the 2000 presidential election in general and by controversies that developed in Florida, the state that would decide the final outcome of the election, would gradually emerge during the thirty-six days following November 7. The fierce polemic engendered by the election took shape during that period and has continued ever since. Moreover, what is perhaps most salient about the many perspectives that have emerged from the polemic is that for the most part they have remained divided along partisan lines. The aim of this collection of essays is to provide a representative sampling of the polemics and perspectives generated to date as a consequence of the 2000 presidential election. Concerning the polemics, we have made a concerted effort to provide a balance between Bush and Gore sympathizers. With respect to perspectives, however, we have endeavored to provide a wide variety, in terms of both differences in time and differences in geography. Thus some of the essays included were produced during the heat of the postelection battle that preceded the December 12 Supreme Court decision or shortly thereafter. Others were written with somewhat greater temporal distance, up to six months after that fateful December date. Although six months may be hardly relevant from the standpoint of history, the political mood in the United States is palpably different at this writing in June 2001 than it was in December 2000. In terms of geography, the contributors to this volume certainly range far and near. At least two of them, Henry Brady and Charles Fried, were directly involved in the Florida battles, the first as a political scientist working for Gore and the second as counsel of record for the Florida legislature in two cases relating to the election. Farthest removed geographically from Florida are the authors from Europe and the Middle East, who provide valuable foreign perspectives on America's millennial election. The authors differ among themselves but converge on two somewhat disparate points: (1) amazement at the arcane and archaic nature of the American electoral system and at the pitfalls deriving from reliance on local control and (2) admiration for the great resilience and stability of the American political system in the face of the long uncertainty concerning the outcome of the presidential election and of the heated disagreements over the propriety of Supreme Court intervention. In addition, the perspectives included in this volume are divided among participants in the postelection controversies, contemporaneous observers, and those who have analyzed the events based on a review of the record. Moreover, among those who had no direct experience with the millennial election, some have had relevant involvements in other elections. Thus Shlomo Avineri has often been an official foreign observer in many national elections, and Justice Noëlle Lenoir, until recently a member of the French Constitutional Council, has had an official role in that capacity for the supervision of the French presidential election of 1995 and for monitoring the vote count in its aftermath. Whereas the millennial election—in particular, the events surrounding the election in Florida—provides the main focus of this volume, the subjects addressed in the various essays are far ranging. As the essays amply demonstrate, the continuing fascination with the millennial election stems not only from the heated controversy it has unleashed but also from the crucial questions it has raised concerning subjects as diverse as the essential tenets and fault lines of American democracy; the relation between law and politics; the legitimate constraints on judicial interpretation; the virtues and vices of federalism as it relates to the tension between local control and uniformity of conditions for all voters and vote counters; the difficulties of achieving justice through law; the hurdles confronting the adaptation of social scientific statistical evidence for use in a legal proceeding; and the confrontations between liberty, equality, citizenship, and nationhood in the context of discrepancies between America's pre-Civil War constitutional heritage and its post-Civil War counterpart. Among this wealth of diverse perspectives and subjects, certain issues and queries stand out and deserve brief mention here as they transcend the bounds of the individual essays. Chief among these are the fact that America's Constitution and laws are ill equipped to deal with problems such as those that arose in relation to the millennial election. As Richard Pildes, one of the foremost experts on election law, makes plain in his clearly nonpartisan overview of the legal framework available to deal with disputed elections, the combination of America's eighteenth-century Constitution and the patchwork of imperfect and incomplete state and federal laws relating to elections makes it virtually impossible to reach satisfactory or nonpartisan resolutions of serious election disputes. Consistent with this, whatever resolution of the 2000 election may have been reached in accordance with the Constitution and applicable law would inevitably have appeared unfair and partisan to about half the electorate. It follows that impressions of partisanship in the resolution of the disputes arising out of the Florida election were at least in part attributable to deficiencies in the relevant legal designs. That still leaves open the question of whether the resolutions at stake were unduly, excessively, or gratuitously partisan. Significantly, the various essays in this volume are quite divided on this latter question. By and large, the assessments of the judicial opinions, both state and federal, contained in this volume can be sorted out along partisan lines. Those who sympathize with the Democrats tend to defend the legitimacy of the Florida Supreme Court decisions and attack that of the U.S. Supreme Court December 12 decision. Republican sympathizers tend to draw entirely opposite conclusions. This contrast is most vividly illustrated by the two longest essays dealing with the various state and federal judicial opinions, by Michel Rosenfeld and Nelson Lund respectively. Rosenfeld argues that the Florida Supreme Court acted well within the bounds of judicial legitimacy while the U.S. Supreme Court majority violated the fundamental principles of consistency and integrity. Lund maintains that the Florida Supreme Court "careen[ed] out of control," completely beyond the bounds of permissible legal interpretation, and the U.S. Supreme Court majority could not have done otherwise than it did without abandoning principle and precedent. What is one to make of this stark discrepancy? Can analysis rise above partisanship? And if it can, which of these two diametrically opposed positions is more consonant with any possible nonpartisan criteria? Based on the U.S. Supreme Court's December 12 opinion and a reading of all the essays bearing on the relevant judicial opinions, readers will be able to answer these questions for themselves. Regardless of the conclusions one ultimately reaches, however, the justices who decided Bush v. Gore took positions that, at least on first impression, seem strongly at odds with their previously expressed views. This observation, moreover, is equally applicable to the justices in the majority as to those who dissented. Thus, for example, it seems odd that Chief Justice Rehnquist and Justices Scalia and Thomas who have traditionally espoused a narrow conception of equal protection limited to prohibiting discrimination on the basis of race, religion, or national origin, should have agreed to find a violation of equal protection (and possible due process) based on discrepancies in the manner in which votes were recounted. Conversely, it seems surprising that Justice Ginsburg, who has championed equality for women as a civil rights attorney and who certainly ranks as one of the justices with the most expansive views of equal protection on the present Court, should have concluded that the discrepancies did not even raise a plausible constitutional claim. Furthermore, at least on the surface it seems particularly ironic that the Chief Justice, joined by Justices Scalia and Thomas, the fiercest defenders of the prerogatives of the states against federal encroachment, filed a concurring opinion raising objections against a state supreme court's interpretation of its own state's law. By the same token, it seems noteworthy that two of the dissenters, Justices Ginsburg and Stevens, should have embraced positions seemingly grounded on complete deference to state court action and on state law in the face of challenges under the federal Constitution and federal law. Are some or all of these apparent discrepancies equivalent? Can some or all of them be explained away after careful examination? Do they evince a surrender to politics? Or do they ultimately demonstrate steadfast adherence to principle notwithstanding impressions to the contrary? Another important issue brought to the fore by Election 2000, but with important ramifications that spread far beyond it, concerns the continuing viability of the Electoral College and its role in relation to democracy. The Florida election raised questions about the desirability of the Electoral College in two different but equally dramatic ways. First, if it were not for the Electoral College, the vicissitudes surrounding the Florida election and its aftermath would have had but minor repercussions. Indeed, since Gore won the nationwide popular vote by more than five hundred thousand votes, absent the Electoral College the disputed events in Florida would have had no impact on the outcome of the national election. Second, even if the award of Florida's twenty-five electoral votes to Bush had been unanimously accepted as unquestionably warranted, it would still have been the case in 2000, for the first time since the nineteenth century, that the winner of the Electoral College majority happened to be the loser of the popular vote. Underlying these issues concerning the Electoral College are questions of both substance and procedure. From a substantive standpoint, the key question is that of the relation between the Electoral College and democracy. Unlike in a unitary country such as France where democracy is envisioned as majority rule on a nationwide scale, in the United States democracy has been conceived in terms of competition among mutually constraining majorities operating at both the state and the federal level. Yet even in this scheme of "checks and balances" among diverse democratic majorities, the presidency occupies a special place: It is the only national office, and the president is the only elected official (with the vice president) who represents all the citizens on a nationwide scale. And hence the debate—made all the more heated and urgent by Election 2000—over whether it would be preferable to have a direct nationwide popular-vote-majority election for president or to stick to the present system, which is meant to give states an important mediating role through preservation of the Electoral College. From a procedural standpoint, what the 2000 Florida election underscores is the lack of uniformity in how votes are cast and counted throughout the United States. Moreover, this lack of uniformity exists not only from one state to the next but also, as the focus on Florida amply demonstrated, within a single state. Indeed, as is now well known, each of Florida's sixty-seven counties was responsible for organizing the presidential election within its territory. This led to many glaring disparities, including the fact that a voter in a punch-card-ballot county was three times more likely not to have his or her vote counted than a voter in some of the optical-scan machine-ballot counties. Procedural reform seems much more likely and less controversial than substantive reform. This is in part because the basic procedural goals—equal voting conditions for all eligible voters and an accurate count of the vote—are generally accepted and uncontroversial. Substantive goals do not enjoy any comparable level of uniform support, as they depend on different conceptions of democracy and of how democracy might best be promoted. Significantly, Florida and Georgia have already adopted important reforms regarding the conduct of future elections. At this writing, however, little has occurred at the federal level. It is within the powers of the federal government either to encourage state reforms through subsidies or to mandate that national standards apply to all federal congressional elections, for all practical purposes ensuring uniformity throughout the country. Indeed, although Congress cannot directly regulate presidential elections under the Constitution, it can do so with respect to congressional elections. Accordingly, if nationwide standards applied to the latter, it would be both impractical and costly for states to conduct completely separate voting procedures in presidential elections. Finally, even without movement on the federal front, all states may eventually be forced to adopt uniform systems throughout their territories to conform to plausible further elaborations of the Supreme Court's equal protection ruling in Bush v. Gore. Many conceivable substantive changes, such as abolition of the Electoral College, confront not only a lack of consensus but also constitutional hurdles that are difficult to surmount. Even if a vast majority of Americans were to support abolishing the Electoral College, this would require a constitutional amendment. Before such an amendment could be adopted, however, three-fourths of the state legislatures (or specially organized conventions in three-fourths of the states) would have to ratify it. And this would be highly unlikely given the widespread belief that smaller states would lose much of their influence on presidential elections with the abolition of the Electoral College. Arguments for and against the abolition of the Electoral College are found in the essays in part 6. In addition, several other possible reforms, some requiring a constitutional amendment, others not, have been formulated. Each of these has certain advantages and disadvantages and promotes a somewhat different kind of democracy. Two proposals deserve brief mention, for they both seek to preserve the role of states in the election of the president while eliminating—or at least greatly minimizing—the likelihood that the loser of the popular vote nationwide would be nonetheless the winner of an Electoral College majority. The first proposal would retain the Electoral College as currently constituted but would replace its winner-take-all aspects by a more proportional system. Under the present system, each state has a number of electors in the Electoral College corresponding to the number of congressional districts into which that state is divided—each congressional district corresponding to a unit of population, with the proviso that each state shall have at least one congressional district no matter how sparsely populated—plus two corresponding to its two senators. Moreover, all states but two—Maine and Nebraska—operate a winner-takes-all system, such that the presidential candidate with the largest percentage of the popular vote in the state wins all the electors to which that state is entitled. Thus, for example, if a candidate wins California by a single vote, he or she is awarded all of that state's 54 electors, who represent 20 percent of the 270 needed to win a majority of the Electoral College and hence the presidency. Suppose further that the opponent of the California winner wins New York—the state that in 2000 had the largest number of electors after California—by a margin of two million votes, then that opponent would have 33 electors against the other candidate's 54, notwithstanding having won the combined California-New York popular vote by 1,999,999 votes. Under the system currently in force in Maine and Nebraska, the electors can be split if different candidates win in different congressional districts. For example, Nebraska had five electoral votes in 2000 (all of which were awarded to Bush) and hence three electoral districts. If one candidate had won a large majority in one congressional district and an overall majority throughout the state but had narrowly lost in the two remaining congressional districts, then that candidate would have ended up with three electors (one corresponding to the congressional district the candidate had won plus the two corresponding to the state's two Senate seats that are awarded to the statewide winner) and his or her opponent would have ended up with two (corresponding to the two districts won by that opponent). Now, if all the states adopted the Maine-Nebraska formula, then the likelihood that the popular vote loser would win a majority of electors would be greatly diminished. Another possibility along similar lines would be for states to apportion electors, not in relation to congressional districts, but according to a system based on the principle of proportionality. The focus would remain on the statewide vote, but instead of awarding electors on a winner-takes-all basis, they would be apportioned according to the respective percentages of the vote guaranteed by the various candidates. Returning to the example of California and New York, under such a proportional system, the winner in California by one vote would be awarded 28 electors and the loser 26. Furthermore, the winner in New York by two million votes would be awarded, say, 22 electors and the loser 11. Under this scheme, the winner of a large majority of the combined California-New York vote ends up with a majority of the electors from the two states: 48 to 39. A shift from a winner-takes-all system to one based on the principle of proportionality would not require a constitutional amendment to the extent that such a change is within the existing powers of the several states. Another suggestion along similar lines, however, would require a constitutional amendment. According to this suggestion, the Electoral College ought to continue to function as it currently does, except that a bonus of an additional number of electors would be awarded to the nationwide winner of the popular vote. Proponents of this change can argue that it preserves the current role reserved for the states in presidential elections while virtually eliminating the possibility that the winner of the popular vote might lose in the Electoral College. This argument seems persuasive inasmuch as Bush pulled ahead of Gore by a margin of four electoral votes on being officially declared the winner in Florida. The 2000 election rekindled the debate over the desirability of retaining the Electoral College—which is not only an eighteenth-century device but also one originally promoted to safeguard the interests of slaveholding states—and several of the essays provide useful insights and varied perspectives. In the end the conclusions one may draw from this debate depend on one's view of how federalism ought to be factored into presidential elections and to what extent the presidency ought to be linked to national majorities as opposed to the competition among a plurality of subnational majorities. Moreover, while it seems important that the president enjoy a mandate, it is debatable given the present set of circumstances which mandate or even whether any cogent mandate can be discerned or sustained over time. To some, winning the majority of votes cast on election day would give a president-elect a legitimate mandate to govern and to press for his or her political agenda. But how relevant is such a mandate in the face of constant polling concerning approval of the president and his or her policies throughout the entire duration of the presidential term? Or in the face of the current system of financing presidential elections? Or of the fact that fewer than half the eligible voters in the United States vote in presidential elections? In short, the 2000 election has raised many new questions and revived many old ones concerning presidential elections and democracy in the United States. The essays in this volume address many of these questions and concerns. They provide some answers and set a framework for further discussion. Given the urgency and complexity of the issues involved, however, it is hoped that the analysis provided in the following pages will spur further inquiry into the numerous fundamental questions brought to light by Election 2000. This book is divided into six parts, preceded by a chronology of the most salient events during the extraordinary period between election day, November 7, 2000, and inauguration day, January 20, 2001. Part 1 contains two essays by a participant in the "battle for Florida," Henry E. Brady, a political scientist who worked as an expert on behalf of Gore. In chapter 1, "Equal Protection for Votes," Brady provides statistical evidence for his claim that the differences among different voting devices throughout Florida far outweighed—by a factor of ten to twenty—any variability attributable to inconsistencies found in manual vote recounts. In chapter 2, "Law and Data: The Butterfly Ballot Episode," Brady and several coauthors—other political scientists who joined him to provide expert testimony in Palm Beach County's "butterfly ballot" cases—recount their experiences as experts trying to reconcile the "facts" they found and the "law." In addition to providing a unique day-to-day account of their involvement as statisticians in the legal battle in Palm Beach, the chapter conveys its authors' frustrations resulting from what they conclude is the legal system's inability to cope with the scientifically provable fact that the voting system fails "to convert people's vote intentions into counted votes." Part 2, "The Machinery of Democracy in America," contains a single chapter by Richard H. Pildes titled "Disputing Elections." As already noted, Pildes takes a nonpartisan approach as he analyzes the legal and institutional conditions that circumscribed the disputed 2000 election. Stressing that neither the Constitution, nor existing law, nor the prevailing institutional mechanisms are adequately equipped to deal fairly and efficiently with problems such as those that arose in Florida, Pildes concludes that no conceivable resolution of the controversies could have avoided the appearance of partisanship. He also notes that nearly all the scholarship on the election and court decisions seems palpably partisan, and that may be due, at least in part, to the absence of accepted canons of judicial interpretation of the Constitution or of federal laws. Pildes further indicates that the U.S. Supreme Court greatly contributed to the impression that its final decision regarding the election was partisan, by not refraining from intervention, or from limited intervention designed to set appropriate constitutional standards, but leaving it to Congress to make the final decisions. Indeed, the Constitution clearly gives Congress a role in settling disputes in presidential elections, but it is silent about any such role for the Court. Pildes reminds us that resolution in Congress is also bound to be partisan and notes that regardless of whether the Court's intervention was appropriate, it was not an isolated occurrence or an aberration. Instead, it fit as part and parcel of the present Court's trend to "constitutionalize democracy" by making itself "the exclusive arbiter . . . of the most basic aspects of democratic politics itself." In Pildes's view, the relevant institutions designed to handle election disputes such as those that arose in 2000 can never transcend partisanship, but the goal should be to turn to institutions that would channel partisanship in less destructive directions. Two U.S. Supreme Court decisions in effect settled Election 2000. The first of these, the grant of a stay on December 9, 2000, ordered that all vote counting in Florida be stopped until the Court could decide Bush's appeal on the merits. While commentators—including those whose essays are included here—disagree on whether the Court had a valid justification for granting the stay, the issuance of an opinion in the context of a stay is—as Justice Scalia, the opinion writer, himself noted—highly unusual. Moreover, both the short concurring opinion filed by Justice Scalia and the dissenting opinion signed by four justices provide a remarkably succinct account of the sharp battle lines drawn within the Court. The December 12 decision is the Court's final decision on the merits. It consists of a per curiam opinion, a concurring opinion by three justices, and four dissenting opinions. The use of a per curiam opinion in what is ultimately a 5-4 decision seems odd, at least on first impression. In general, per curiam—that is, by the court—opinions appear to be used for unanimous decisions or for relatively unimportant or primarily procedural decisions. If this is the case, is the per curiam opinion in Bush v. Gore deceptive? Was it intended to convey the impression that the Court as a whole (or at least the seven justices who concluded either that there had been a violation of equal protection or that there might have been such a violation) was behind the decision when only five justices agreed with the result? Or was the "per curiam" label used because its presumptive authors, Justices O'Connor and Kennedy, did not want to append their names to the majority opinion? As demonstrated in Arthur J. Jacobson's essay on the origins and uses of per curiam opinions by the Supreme Court (chap. 8), matters are generally more complex. Nevertheless, speculation about the use of a per curiam opinion in Bush v. Gore is not likely to vanish any time soon..
Part 3, "The Decisions," contains six essays that deal with the decisions by the Florida courts and/or the U.S. Supreme Court. Chapter 5 consists of an exchange between Ronald Dworkin, the first leading legal academic to criticize the U.S. Supreme Court decision in the essay included here as chapter 4, and Charles Fried, another leading legal academic who represented the Republican-controlled legislature in federal cases relating to the election. Dworkin's essay (chap. 4), written on December 14, 2000, two days after the Supreme Court decision, is particularly noteworthy for at least two distinct reasons. First, it is a reasoned contemporaneous reaction to the Supreme Court decision; and second, it frames both the liberal case against the Court's decision and the broader subsequent debate about the Court's intervention to put an end to the election. Dworkin emphasizes that the Supreme Court's December 12 decision is one of the least persuasive he has ever read and that the 5-4 split among the justices is most disturbing because it does not track the ordinary split between liberals and conservatives evident on such issues as federalism, abortion, or homosexual rights. According to Dworkin, no established conservative position justifies the decision reached by the Court's conservative majority. Therefore, one is left to wonder if the justices in the majority would have reasoned the way they did if that would have led to sealing a victory for Gore. In the second part of his essay, Dworkin advocates abolishing the Electoral College by adopting a constitutional amendment that would provide for election of the president by a plurality of the national vote in a direct election. In his response to Dworkin, Fried acknowledges that the case was a difficult one but vigorously rejects any implication that the Court acted injudiciously or out of partisan zeal. Fried emphasizes that the Court did not seek to intervene in the election but that once it had the case before it, it did the best it could. Fried then argues that the Court's majority legal positions were plausible and defensible and that Dworkin's attack on the Court's conservatives is unwarranted. According to Fried, the Court's four liberal dissenters were no less partisan than their colleagues in the majority. Moreover, Fried maintains that two of the justices in the majority, O'Connor and Kennedy, are not really conservative, as they had voted to uphold abortion rights. Similarly, two of the "liberal" justices, Souter and Breyer, agreed with the majority that the vote recounts ordered by the Florida Supreme Court involved an equal protection violation. Although Fried acknowledges that the Court's majority statement that December 12 constituted the deadline for vote recounts in Florida was the weakest link in its decision, he strongly believes it had no practical effect on the outcome of the election. As he sees it, even if the Florida Supreme Court had ordered a new recount under constitutionally valid standards, such a recount could not have been concluded by December 18, the deadline for reporting electoral votes. In short, Fried concludes, the Court acted creditably in the face of unique and freakish circumstances. In his reply to Fried, Dworkin disputes several of Fried's arguments and states that Fried's essay has not convinced him that there can be a plausible principled defense of the majority's reasoning in Bush v. Gore. Chapters 6 and 7, by Michel Rosenfeld and Nelson Lund respectively, come to dramatically opposed conclusions concerning the justifications for the decisions by the Florida Supreme Court and the U.S. Supreme Court. Rosenfeld finds the former justified because it falls within permissible bounds of judicial interpretation and the latter clearly unjustifiable under the same criterion. Placing the Florida and U.S. Supreme Court decisions in their broader context, Rosenfeld argues that the events that culminated with the U.S. Supreme Court's decision awarding the presidency to Bush are the result not only of a failure of the Court but also of serious shortcomings with the Constitution, federal and state laws, and the current state of American democracy. Because of all these factors, Rosenfeld maintains, no fully satisfactory solution of the problems raised by Election 2000 was likely. Nevertheless, according to Rosenfeld, none of this relieves the U.S. Supreme Court's majority of responsibility for having rendered an ill-advised decision that lacks both consistency and integrity. Rosenfeld stresses that the relevant legal and constitutional provisions that the Court had to interpret were neither complete nor transparent and that they were, accordingly, amenable to different judicial interpretations. This meant that certain liberal and certain conservative interpretations could be justified but that the Court's majority failed all tests of consistency or of integrity, be they liberal or conservative. In contrast to Rosenfeld, Lund denies that the relevant legal and constitutional provisions were legitimately open to differing interpretations. According to Lund, based on precedent and the "plain meaning" of the legal texts at stake, the interpretations of the Florida Supreme Court were entirely without justification whereas those of the U.S. Supreme Court were the only legitimate ones. Specifically, Lund insists that the U.S. Supreme Court's finding that the vote recount ordered by the Florida court violated the Equal Protection Clause is not only justified but compelled by the Court's previous voting rights jurisprudence. Furthermore, Lund argues that the ubiquitous attacks against the Court's pronouncement that since December 12 was the deadline for vote recounts, no time remained for any further recounts, consistent with the Court's equal protection ruling, were based on a widespread misconception. In Lund's reading, far from acting arbitrarily to ensure a Bush victory, the U.S. Supreme Court was simply following the Florida Supreme Court's interpretation of Florida law pursuant to the unanimously accepted principle that federal courts are bound by a state's highest court interpretation of that state's law. It is noteworthy, however, that one of the justices on the Florida Supreme Court stated, in the course of its dismissal of the Florida cases consistent with the U.S. Supreme Court's December 12 decision, that the U.S. Supreme Court had misinterpreted the Florida court's ruling on the state law in question. Does that undercut Lund's argument? Or should it be disregarded as an after-the-fact attempt by the justice in question to rehabilitate the reputation of his own court? Although most critics of the U.S. Supreme Court majority disagree, Lund's (and Jacobson's) answer to such objections is that the U.S. Supreme Court left the Florida court free to correct whatever misinterpretation the Supreme Court majority had made of Florida law or to change its mind about what Florida law required and proceed with a recount. In chapter 8, "The Ghostwriters," Jacobson explores the origins and evolution of per curiam opinions to test the claims of certain liberals that the use of the per curiam decision in Bush v. Gore was misleading and designed to detract attention from the narrow 5-4 majority by giving the impression that they were speaking for the Court. Based on his historical research, Jacobson reports that the U.S. Supreme Court's use of per curiam decisions effectively began in 1883. Significantly, while such decisions were unanimous at first, that began to change in 1909, when Justice Holmes dissented from a per curiam opinion. Moreover, since the 1940s the number of per curiam opinions with dissents has greatly increased. According to Jacobson, what this means is that today "per curiam" does not stand for unanimity but is rather the equivalent of the Court's majority stating that "this case ought to be unanimous." When viewed in this light, Jacobson concludes, it is Justices Souter and Breyer and not their colleagues in the majority who may have acted questionably. Because Justices Souter and Breyer shared with the majority the belief that the recounts ordered by the Florida Supreme Court violated equal protection, they ought to have joined the majority's per curiam opinion. Their only disagreement with the majority was that they concluded that Florida law did not require completion of the count by December 12, the very day of the Supreme Court's decision in Bush v. Gore. As to that issue, they could have done what five justices did in another celebrated case whose opinion was per curiam, Buckley v. Valeo: concur in part and dissent in part. With a 7-2 rather than a 5-4 majority, the rhetorical, hence political, effect of the Bush v. Gore per curiam, Jacobson argues, would have been very different. The final chapter in part 3 is unlike all others in that it is in the form of fictitious opinions written as if they were penned by the U.S. Supreme Court justices who decided Bush v. Gore. Burt Neuborne, a leading civil rights advocate, wrote these opinions to demonstrate to his law students that although the various actual opinions filed in Bush v. Gore appear to be unprincipled, this by no means needed to be so. As a veteran champion of individual rights who has won many constitutional cases and who thus has firsthand experience on the important institutional role the Court has played over the years, Neuborne believes that it would be unfortunate if those disappointed by the Court gave up on the institution. Surmising that the actual opinions suffered from the extreme time constraints under which their authors labored, Neuborne imaginatively and artfully crafts as principled and well reasoned as possible a statement for each of the positions articulated by members of the Court. Part 4, "American Perspectives," brings together four essays that explore the broader implications of Election 2000 and of the U.S. Supreme Court decision of December 12. Chapter 10, "Anatomy of a Constitutional Coup," by Bruce Ackerman, places in context the actions of Bush, his brother, Jeb, governor of Florida, Republican demonstrators, the Florida legislature, and the U.S. Supreme Court and concludes that collectively they mounted what is tantamount to a constitutional coup with disturbing and lasting implications for America's constitutional rule and democracy. Building on his widely disseminated thesis that America's Constitution is a living one—which evolves less through formal amendments than through transformations shaped by moments of widespread consensus on fundamental society-wide issues known as "constitutional moments"—Ackerman regards the resolution of Election 2000 as an illegitimate effort to reinstate the obsolete written Constitution. In Ackerman's view, the twentieth-century presidency shaped by such men as Wilson, Roosevelt, and Reagan had virtually nothing in common with the presidency envisioned by the authors of the 1787 written Constitution. By ignoring the fact that the legitimacy of modern presidents stems from the mandate they obtain from the American people rather than from the arcane preoccupations that led to constitutionalization of the Electoral College, the Republicans and their allies on the Court thus—consistent with Ackerman's analysis—pulled off a veritable coup. Ackerman also discusses what would have most likely happened had the Supreme Court refrained from deciding the election and had it allowed Congress to settle the matter as foreseen in the Constitution. Contrary to some conservative commentators, Ackerman is confident that the result would not have been worse or less legitimate. Chapter 11, by George Fletcher, is titled "The Many Faces of Bush v. Gore." Specifically, Fletcher sees three distinct faces reflected in the Supreme Court decision. The first of these is the narrowest: the Court's decision could be distilled to an interpretation—albeit a disputed and perhaps erroneous one—of the Florida decision under review that asserts Florida law required vote recounts to be completed by December 12. The second face, according to Fletcher, is shaped by the assumption that federal courts should regulate state-run elections for the American presidency. This second face, moreover, calls for reconciliation of the Court's decision in terms of broader principles and more abstract arguments of justice. Fletcher finds the Court's decision wanting from the standpoint of these principles and arguments, in an analysis that echoes that of many of the other critics of the decision. Fletcher, however, provides an entirely novel approach, from the standpoint of the third face of the decision, which he characterizes as the product of the clash between the two distinct constitutional orders that have been implanted in the course of American history. The first of these orders emanates from the 1787 Constitution and has as its cornerstones "We the People" conceived as a voluntary association, the pursuit of liberty, and political elitism envisioned as a New England town meeting where public issues were decided by the propertied few. In contrast, the second order, which originated during the Civil War, regards the country as a nation rather than a voluntary association, emphasizes that all men are created equal, thus imposing equality under law, and shifts from elitism to popular democracy. Fletcher goes on to argue that from the perspective of the third face, the Supreme Court's emphasis on federal control of state presidential elections and its insistence on equal protection can be regarded as consistent with deployment of the dictates of the second constitutional order. Fletcher concludes, however, that in thwarting rather than buttressing democracy, the Court ultimately failed to accommodate an essential component of the second constitutional order that has become firmly rooted since the Civil War. Richard Brookhiser's essay, "Springtime for Rousseau"—a title that evokes the highly comical though designedly tasteless exploitation of a fictitious musical titled "Springtime for Hitler in Germany" in the musical comedy The Producers—raises an important question about democracy while ridiculing certain Democrats' complaints about Election 2000. Referring to a liberal Democrat who criticized Republican conduct in late November 2000 with the comment that "The whiff of fascism is in the air," Brookhiser proceeds to discredit the Democrats' call for new vote counts or a new vote. While Brookhiser portrays the Democrats as sore losers, he raises an important question by refusing to accept on faith the widely held proposition that the purpose of elections is to allow for the expression of the will of the people. Brookhiser argues that it is not clear what the will of the people or of the majority is, and even if it were, it is not clear what its relevance may be given that political majorities are prone to constant shifts. Consistent with these views, it is Rousseau, perhaps the fiercest defender of democratic self-government, who deserves the label "fascist." For Rousseau, democracy requires implementation of the "general will." But because according to Rousseau's logic everyone must be subjected to the general will, some have accused him of being a precursor of totalitarianism. Following that line of reasoning, Brookhiser suggests that Rousseau's democracy is fascist in at least two senses. First, the general will is oppressive and forces the individual to forgo his or her independence in order to serve democracy. Second, many oppressive regimes, including Hitler's, have been put or kept in power as a consequence of votes construed as expressing the will of the majority or of the people. Hence the reference to fascism and the link between Rousseau and Hitler. While Brookhiser's view of Rousseau and his intimation of the link between the latter and Hitler is, to say the least, controversial, the questions of how periodic voting relates to democracy and how democracy relates to good policies are serious ones, deserving of greater attention. In chapter 13, "Machiavelli in Robes? The Court in the Election," Frank Michelman explores the implications of the fact, amply established in opinion polls, that a large percentage of Americans were relieved by the Supreme Court's decision in Bush v. Gore although they were convinced that the justices had acted out of political motivation rather than in accordance with legal principle and justice. Michelman does not labor under the hypothesis that the justices in the majority wanted Bush as president. Instead he works on the assumption that the justices decided as they did, knowing that there was no sound basis in law for their decision, because they felt it imperative that they save the nation from further strife and disruption. In short, the Court sacrificed law to order. Michelman notes that the Court's decision was shrouded in hypocrisy and that a vast segment of the American people went along, thus becoming an accomplice in that hypocrisy. This conclusion brings Michelman to Machiavelli's Prince whose obligation is to lie and violate the law if necessary to safeguard the well-being and safety of his subjects. Although he acknowledges that it may be good for leaders in a republic to be Machiavellian sometimes, Michelman wonders whether it should ever be acceptable for the Court to be Machiavellian. Unlike the Prince, the Court has neither the power of the sword nor that of the purse. The Court must rely on its persuasiveness and reputation for integrity, and Michelman sets out to determine whether nonetheless the Court can, on rare occasions, afford to be Machiavellian. Part 5, "Foreign Perspectives," consists of five essays by foreign authors that convey a strong sense of how Election 2000 was perceived beyond the shores of the United States. The authors in this part are not only from different countries, they also have different professional experiences. Two have been constitutional judges, two are political scientists, and one is a professor of law. In chapter 14, "A Flawed yet Resilient System: A View from Jerusalem," Shlomo Avineri traces the principal systemic flaws that led to the difficulties encountered in the course of Election 2000 to the problem of running a twenty-first-century democracy within the framework of an eighteenth-century constitution designed for a republic that was not meant to be democratic in any modern sense of the term. Avineri stresses that in spite of a patchwork of reforms, since the eighteenth century the current constitutional and legal apparatus is not up to the task. While Avineri admires the American system's resilience—he observes that at no time during the crisis was there any danger of a coup or a military takeover—he maintains that the crisis was more serious than most Americans thought. He finds it particularly disturbing that the system did not provide any clear exit strategy, leaving in limbo for well over a month the identity and legitimacy of the person about to become the most powerful political officeholder throughout the world. Avineri points out how anomalous, in the context of modern democracies, it is for Bush, who lost the popular vote to Gore by more than five hundred thousand ballots, to have won the presidency. While similar situations may occur in certain parliamentary democracies, Avineri emphasizes that in no country with an executive presidency subjected to universal suffrage can any candidate who has won fewer votes than his or her opponent be the winner. Furthermore, Avineri also criticizes the constraints that federalism imposes on the fairness and efficiency of elections to national office. Finally, he reports how in his own country, Israel, where elections are centralized and voter registration made easy, the problems that chronically plague American elections—such as the exclusion of significant numbers of minority citizens as was the case in 2000 in Florida—are by and large avoided. In chapter 15, Justice Noëlle Lenoir, until recently a member of the French Constitutional Council, discusses how disputed elections are handled in her country and considers whether disputes such as those involved in Bush v. Gore could arise in France. Lenoir possesses a unique perspective as the French Constitutional Council monitors and certifies all elections—including presidential ones—in addition to having the exclusive power to determine if the laws enacted by the French Parliament are constitutional. Moreover, as a member of the Constitutional Council from 1992 to 2001, Lenoir participated in monitoring and certifying the French presidential election in 1995. Unlike the United States, France is a unitary and highly centralized state, and its national elections are conducted under uniform conditions throughout the national territory. Also, in contrast to its American counterpart, the French Constitution of 1958 and French law provide extensive unified guidelines, constantly updated to account for changing circumstances, for supervising elections and for dealing with electoral challenges. France does not have presidential primaries but, as Lenoir underscores, a nominating process followed by designation of candidates, a campaign, and one or two rounds of voting, depending on whether any candidate in the first round obtains a majority of the votes cast. The Constitutional Council, in turn, is involved throughout the process, from nominations to final certification of the winner. Because the Constitutional Council routinely deals with all elections, it does not risk raising partisan suspicions as the sporadic and highly unusual intervention by the U.S. Supreme Court in Election 2000 did. Nevertheless, Lenoir discusses whether, and to what extent, there may be a risk that the Constitutional Council would deal with election disputes in a partisan manner. This discussion is particularly important, for on the surface at least, the Constitutional Council appears to be a more political institution than the U.S. Supreme Court. Members of the Constitutional Council are appointed for nine years. One-third of them are appointed by the president of the Republic, one-third by the president of the Senate, and one-third by the president of the National Assembly. Unlike in the United States where appointment to the Supreme Court often requires compromise by the president and a majority in the Senate, appointments to the French Constitutional Council can be—and often are—purely political. Although Lenoir acknowledges that it would be possible for the Constitutional Council to resolve a contested election in a partisan manner, in practice it has remained above the political fray. As she suggests, since intervention is regular and routine under clear and comprehensive guidelines, the potential for partisanship is minimized. To that one may add that unlike in the United States, where Supreme Court intervention in a presidential election may not occur again for a long time, any partisan bias in favor of one candidate or party by the Constitutional Council may inevitably invite retaliation the next time around. In short, as the role of the Constitutional Council in elections is regular and clearly prescribed, paradoxically the political nature of its makeup may be the best antidote to partisan bias. Justice Dieter Grimm was until recently a member of the German Constitutional Court. Although Germany is a parliamentary democracy and hence could have no experience akin to that of Election 2000, its experience is valuable for comparative purposes inasmuch as it has a federal system and its Constitutional Court is empowered to adjudicate certain disputes relating to elections. In chapter 16, Grimm indicates why Bush v. Gore could not have occurred in Germany. In spite of Germany's federalism, elections to the Bundestag, the German Parliament, are entirely governed by comprehensive and detailed federal laws and regulations. Ballots are uniform throughout the country, and so are vote counting procedures. Moreover, there is little danger of partisan bias in vote counts and recounts as they are organized under the supervision of nonpartisan bodies. Election disputes are first considered and settled by the Bundestag and can only go to the Constitutional Court thereafter. The court, therefore, cannot, as was the case in Bush v. Gore, decide the election. It can, however, order a new vote in whole or in part as the circumstances may warrant. Like France, Germany has a post-World War II constitution, and though it is not a unitary state, it has uniform elections throughout the country and a comprehensive scheme of regulations to deal with national elections. In chapter 17, "Bush v. Gore: A View from Italy," Pasquale Pasquino assesses familiar aspects of Election 2000 and Bush v. Gore and some less familiar ones from the standpoint of an Italian scholar expert in European democracies and constitutional courts. Some American readers can certainly take comfort that Pasquino views some of the relevant events very much like they do. Beyond that, Pasquino offers a fresh perspective and focuses on aspects of the overall story largely ignored by American authors. Pasquino, for example, highlights a lower federal court decision by Judge Middlebrooks, dealing with and rejecting the kind of equal protection claims that would later prove critical to buttress the Supreme Court's majority in its December 12 decision. Judge Middlebrooks acknowledged that there could not be equal voting conditions under the current decentralized election system in the United States. But rather than regard this as a weakness or as constitutionally unacceptable, Judge Middlebrooks considered it a virtue, as he believed that decentralization was a guarantee against corruption. Also novel and undoubtedly surprising to most American readers is Pasquino's conclusion that the U.S. Supreme Court conducted itself more like a parliament than a court in its approach to the election dispute that culminated in its December 12 decision. In the final essay of part 5, "Democracy in America: A European Perspective on the Millenial Elections," Mattias Kumm engages in a comparison between U.S. federalism as it emerges in the aftermath of Election 2000 and current projections of what may become the government of a unified European Union. Although American democracy and federalism may be characterized as exceptionalist, and so may any viable political union among the member countries of the European Union, Kumm draws many useful parallels and contrasts. Viewed from the standpoint of the European Union, where the member nations retain a strong political, cultural, historical, and linguistic identity, American state citizenship appears relatively insignificant. Accordingly, though the input of the states may have a positive impact on American democracy, the Electoral College and the problems unleashed by Election 2000 are best regarded as odd historical relics. The American example, on the other hand, underscores that the European Union is far from federalism and that there is no clear blueprint for a democracy on the scale of the Union. Part 6, "Reform?" consists of four essays centered on the issue of retention or abolition of the Electoral College in view of the problems highlighted by Election 2000. These essays consider both the desirability and the feasibility of changes, particularly in light of the great unlikelihood of approval in the foreseeable future of a constitutional amendment to abolish or substantially modify the Electoral College. Chapter 19, by Judith Best, one of the foremost U.S. experts on the Electoral College, is titled "Weighing the Alternatives: Reform or Deform?" Best discusses the various alternatives to the present system that have garnered the most interest over the years. These include the direct election plan, supported by 60 percent of Americans, under which the winner of the popular vote in a single nationwide election would become president; the national bonus plan, which would keep the Electoral College but add bonus points for the winner of the popular vote to avoid what happened in 2000, namely, that the winner of the popular vote was the loser of the electoral vote; the instant runoff voting plan, a variation on the direct election plan, which would ensure that the winner obtained a majority rather than a plurality of votes cast; the automatic plan, which would retain the Electoral College but eliminate the possibility that individual electors not cast their vote for the candidate to whom they are pledged—as was the case in 2000 with one of Gore's Washington, D.C., electors who decided to abstain to protest the District's lack of representation in Congress rather than cast her vote for Gore; the district plan, which retains the Electoral College but replaces its winner-take-all feature with an allocation of electors on a (congressional) district-by-district basis; and the proportional plan, another proposal that would retain the Electoral College while replacing its winner-takes-all aspect, in this case by allocating a state's electors proportionally to the percentage of the vote obtained by each candidate. Based on a thorough discussion of the arguments in favor of and against all these possible reforms, Best concludes that retention of the Electoral College with adoption of the automatic plan to eliminate the problem of the faithless electors is by far the preferable alternative. Lawrence D. Longley, a longtime leading critic of the Electoral College, strongly argues for its abolition in his essay, "The Electoral College: A Fatally Flawed Institution." After considering the Electoral College at its best and at its worst, Longley concludes that it is dangerous because it distorts American democracy and threatens in certain cases to undermine the legitimacy of the president. In chapter 21, "The Electoral College: A Modest Contribution," Keith E. Whittington argues that whereas the Electoral College is not among the most important constitutional institutions and whereas he would not advocate adopting it were the Constitution drafted today, he nonetheless believes it ought to be kept. Whittington regards the contribution of the Electoral College as narrow but worthwhile. According to him, the Electoral College contributes to encouraging compromise and consensus building and to minimizing the impact of narrow factions. In the last essay in the book, "Popular Election of the President without a Constitutional Amendment," Robert W. Bennett provides a novel and ingenious suggestion. Bennett's proposal would require state legislation by as few as eleven large states whose total electoral votes equal 270, a majority in the Electoral College. While the legislation in question would require coordination among the relevant states, it would not require acquiescence by smaller states. Smaller states are generally considered obstacles to a constitutional amendment to abolish the Electoral College, as it is thought that they would refuse to yield the influence they can exert under the present system. Against this common wisdom, Bennett indicates that the Electoral College is actually more prone to favoring large states than small ones. As the essays in this volume amply demonstrate, Election 2000 and Bush v. Gore were complex, controversial, and full of rich and varied implications. The essays provide multifaceted insights and perspectives on the various issues and controversies engendered or rekindled by Election 2000. Some of these may fade or intensify in the future, but it is unlikely that any of them will be exhausted or definitively settled. Perhaps what is most striking about all that has been unleashed by the millennial election is the number of paradoxes and ironies it has already produced. In this regard, the findings of one of the news media that conducted a vote recount throughout Florida after the presidential election had been officially settled is exquisite. Had Gore succeeded in having a recount under the standards he advocated in Court, Bush would have won. However, had a recount been conducted under the standards advocated by Bush during the period of protracted litigation, the winner would have been Gore. The American presidential election of 2000 was perhaps the most remarkable, and in many ways the most unsettling, that the country has yet experienced. The millennial election raised fundamental questions not only about American democracy, but also about the nation's constitution and about the legitimate role of American courts, state and federal, and in particular about the United States Supreme Court. The Longest Night presents a lively and informed reaction to the legal aftermath of the election by the most prominent experts on the subject. With a balance of opposing views—including those of some of the most distinguished foreign commentators writing on the subject today—the contributors present an unusual breadth of perspectives in addressing the judicial, institutional, and political questions involved in the disputed election. Their commentaries bring the confusion and frenzy of the event into clear focus and lay the groundwork for an essential public debate that is sure to continue well into the future. The Longest Night contains a thorough chronology of the events in Florida, a detailed account of the institutional structure of American presidential elections, a series of analyses both criticizing and defending the decisions in Bush v. Gore, American perspectives on the Florida struggle and America's electoral system, and a debate on maintaining or reforming the electoral college. The authors include participants in the legal and political battles surrounding the Florida election, foreigners charged with monitoring and supervising elections, and scholars from many disciplines specializing in constitutionalism, democracy, and American election law. Arthur J. Jacobson is Max Freund Professor of Litigation and Advocacy at the Benjamin N. Cardozo School of Law, Yeshiva University. He is coeditor of Weimar: A Jurisprudence of Crisis (California, 2000) and Justice and the Legal System: A Coursebook (1992). Michel Rosenfeld is Justice Sydney L. Robins Professor of Human Rights at the Benjamin N. Cardozo School of Law. He is author of Just Interpretations: Law between Ethics and Politics (California, 1998), Affirmative Action and Justice: A Philosophical and Constitutional Inquiry (1991), and coeditor of Habermas on Law and Democracy: Critical Exchanges (California, 1998). 19. Weighing the Alternatives: Reform or Deform?